1) 66268-03 – Direct Cable (66268-03) – The A10 direct connect cable is an economical way to connect H series headsets to certain telephones that have an RJ9 headset jack, such as Nortel, Mitel and NEC. Please contact our sales team at 800-914-7996 to determine if your phone can use one. 2) 26716-01 Amplifier/Cisco Direct Cable – This cable from Plantronics is designed to fit almost all Cisco phones. 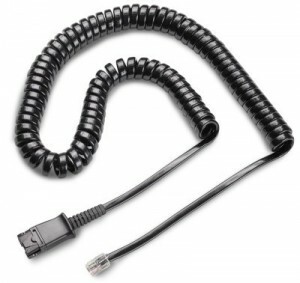 If you have used the compatibility guide, you have seen this is the most common cord used with Cisco phones. These cords are plugged into the headset jack on the phone and then plugged into any of the “H” series headsets. You must have something between the phone and the headset; consider this the conductor telling the telephone and headset how to work together. 3) M22 Amplifier – When you use an amplifier with your telephone, you have just opened a new world for using corded headsets. The M22 is one of the newest amplifiers that is made by Plantronics. The amplifier has phone compatibility on the side of the box; the number 5 is the most common usage. You can also adjust the little circle on the side. The most common mistakes made with the M22, are putting the batteries in incorrectly, not turning the volume up, and plugging into a headset jack. 4) 17590-03 – When you have broken your headband, and the microphone is still good, you can purchase this headband. It will work with the H51 or theH51N. Will not work with the newer models of headsets beginning with HW. 5) 15729-05 – These ear cushions are great to have on hand when you run a call center; replacement is sometimes necessary for sanitary reasons. These match up with several different corded headsets. Compatible with: H51, H51N, H61, H61N, H91, H91N, H101, H101N, SP04, SP05, PLX400, PLX500.